Firstly Happy Canada Day on July 1st everyone, I don't see why we can't all enjoy a celebratory day tomorrow and sing a round of O Canada! Our home and native land! True patriot love in all thy sons command... then, though perhaps it's a heinous crime to mention it in the same sentence, could we have a Happy Independence Day on Monday and make a long weekend of it. And if I have my schedule right then this coming weekend will see our newly wedded Royal couple, the Duke and Duchess of Cambridge on a tour of Canada. We probably all need to brace for a right load of old tosh appearing across the red tops (did you see that Kate had apparently patted a child's head which was clearly an indication of forthcoming babies) so for a more knowledgeable and measured resume of these modern monarchs-in-waiting than you are likely to read anywhere else, head to Mrs KevinFomCanada's guest blog post here. Very sensibly William and Catherine are stopping off for a visit to Prince Edward Island because Anne of Green Gables was a favourite childhood read of the Duchess's, and alright I'm a bit jealous. It's on my list of Places to Go To One Day. I'm sure typing Anne of Green Gables into the Prince Edward Island website is not an unusual thing to do but it has rescued me from royal-trip-envy and I'm sure there is a great deal more on the site since the last time I looked, a wonderful virtual exhibition that I have spent ages wandering around. Lovely pictures of the book jackets... it was a favourite book of my mum's so she bought me this one, and I have the books downloaded free from girlebooks onto my Kindle too because who can know when an Anne Shirley moment may come upon me. On 6 August 1927, a year after writing so approvingly about fashion in her past, Montgomery went to a garden party at Government House in Toronto to meet the Prince of Wales and British Prime Minister Stanley Baldwin and Mrs. Baldwin. She made a special trip to Toronto to buy a new hat to go with her "cocoa-colored lace and georgette" (SJ,III,351). Though she may have lamented the changes in fashion, she was certainly not going to wear anything but the latest style herself! Can you just imagine how excited Lucy Maud would have been about the Royal visit to her island on Sunday. So that all led me to the Lucy Maud Montgomery shelf because she does of course merit a shelf of her own..
and drawn as I am, with Team Edward Thomas, into reading how the Great War affected the diary writers of the time I have been immersed in Volume Two of Lucy Maud Montgomery's Selected Journals 1910-1921. I absolutely treasure these, five volumes edited by Mary Rubio and Elizabeth Waterston, and yes I have just found the elusive Vol IV at a very reasonable £13, having been on the lookout for an affordable edition for several years, so I now have a full set. Spanning the years from 1889 to 1942 they are a fascinating lens on the changing sphere of women's lives and a wonderful resource. Now, whilst I am mindful that she rewrote with an eye for publication so could have been revising in the light of hindsight, but events in Lucy Maud's life surrounding the declaration of war in August 1915 still reveal the state of shock, and the reverberations echoing around the colonies who were also implicated and likely to have to send men to fight. England has declared war on Germany! Good God, I cannot believe it! It must be a horrible dream. It has come like a thundercloud....I sat down weak and unnerved. I could not eat. I could only sit there dumbly trying to realize it - to realize that our Empire was at war. And such a war! No paltry struggle in an out-of-the-way corner - no Boer conflict which we all thought so terrible at the time - but a death grapple. For Germany comes to conquer or die. Strangely I can indentify a little with that fear of war and pregnancy back in the early 1980s, having given birth to Offspringette in 1981 and expecting the Kayaker in early 1983 and watching the Falklands War unfold in 1982. It's a time of heightened emotional turmoil anyway but there was something about that war being the first that Britain had been involved in during my lifetime, and I remember the almost addictive visual presence of those MOD announcements (and you'd keep the TV on in the background for fear of missing one) and there I was with my babies and what sort of a world was this going to be for them. My heart seems broken. On August 13th a darling little son was born to me - dead. ...at first I thought I could not love! All the agony and pain I have endured in my whole life heaped together could not equal what I felt when I realized that my baby was dead - my bonny sweet boy, so beautiful and perfect..
And while I was lying helpless bad war news began to come too, news of the British defeat at Mons...everything seems dark and hopeless. and the diary entries that follow recount that combination of depression and despair over events both personal and international, the jarring letters of condolence, the increasingly tragic war news. In praising the work of women in the war effort, she told a reporter: "But I do hope that it will in some measure open the eyes of humanity to the truth that the women who bear and train the nation's sons should have some voice in the political issues that may send those sons to die on the battlefields." It all led me to another treasure of a book Lucy Maud Montgomery and Canadian Culture by Irene Gammel and Elizabeth Epperly and a chapter entitled L.M.Montgomery and the First World war, an account and analysis of the four novels that she wrote during the war and which clearly seem to reflect her concerns and her distress, Anne of the Island, Anne's House of Dreams, Rainbow Valley and Rilla of Ingleside so more reading to come. I'm not sure how I have ended up in such a sad place after starting in such a happy one, but in many ways isn't that the delight of following a reading trail, you can never tell quite where it will take you. Anyway I wish Kate and William a wonderful day on Sunday and no I'm not jealous at all and I hope he buys her a souvenir doll at least. 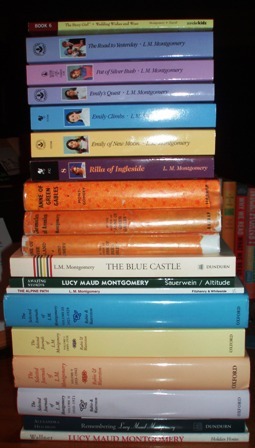 Having decided that I'd make a special little critical reading project of Lucy Maud Montgomery through this winter it then became incumbent upon me to accumulate the tools for the task. I enjoy choosing one author and then reading around them with a bit of accessible academic writing too, so the Lucy Maud books have been trickling in for the last few months. I already have my ancient old copies of Anne of Green Gables and one or two others but they are all as cheap as chips in new copies so I splurged and The Book Depository kindly sent. Suddenly I realise the Lucy Maud shelf is looking quite full and it must be time to make a start. The novels fairly easy to find in new paperback editions but the journals have taken some tracking down. I'm still looking for Volume IV at the cost of less than the national debt.I exaggerate but £70 a bit over the top. "L.M.Montgomery was artist enough to be aware that she was working at a loom for which all the threads were not yet given"
which I think is a good analogy for a journal, it shapes itself into your story, you can have no idea where it will go.Much of Lucy Maud's later life spent in a state of anxiety and depression as she dealt with her husband's mental illness and her children's problems, all a far cry from those jolly little heroines who go through a bit of a life crisis before they find happiness.I'm intrigued to discover the woman behind the writing and it may not all be the stuff of sweetness and light and kindred spirits. "the journal became more and more a necessary confidant - and not only for woe but also for amusement, for self-mockery, for reflective thought, and of course and always, for the flashes of intense response to natural beauty". 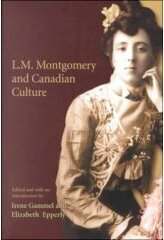 The search for some reasonably readable critical writing took me through blizzard, wilderness and an avalanche or two but eventually I discovered L.M.Montgomery and Canadian Culture edited by Irene Gammel and Elizabeth Epperly. I've had to wait months for it to arrive but now I see loads in stock everywhere, probably could have bought it in Tescos. I love CanLit and have read in and around it for years now, so a book which mines the "Canadianness of Montgomery's writing" was a must. Margaret Atwood, Jane Urquhart and Alice Munro have all expressed their indebtedness to Lucy Maud, Susan Hill perhaps less so but perhaps she just never fancied being a kindred spirit with Anne Shirley and drifting off in a boat whilst quoting The Lady of Shalott.I was always doing that even though I could never muster the matching auburn red plaits and clearly others would have just cut Anne's off given the chance! I'll report back on the Lucy Maud project through the winter months and shall probably fancy a virtual trip to Prince Edward Island from my armchair for good measure.Susan without an 'e' won't be joining me in case you missed this link first or second time round. Let's all own up, Lucy Maud haters hie thee over there >>>>>and pull the poor little orphan girl to pieces. Lucy Maud kindreds you are most welcome here, Marilla has baked a cake and Matthew will be in once he's finished that ploughing and we'll be having a quilting bee. If anyone reading this lives anywhere near Prince Edward Island then go visit forthwith and please please come back and tell us all about it. I suspect Lucy Maud has spawned a big industry and perhaps I need to order an Anne Shirley doll now I think about it.